The new ECO range of dehumidifiers from EBAC, have been launched to help reduce carbon footprint while delivering a high water extraction rate. 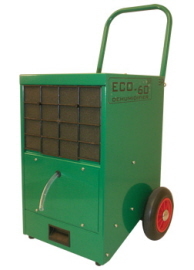 The EBAC ECO60 is the smallest, basic, dehumidifier in the new ECO range from EIPL. The EBAC ECO60 has a maximum l/kWh (water extraction per kW of power consumed) of 1.75 l/kWh. This is achieved by utilizing a high capacity reciprocating compressor and an new environmentally friendly R417a refrigerant. These “no frills” dehumidifiers are basically “plug and play”, connect the drain hose to a suitable drainage point or bucket, plug the unit into a normal 13A wall socket and the unit takes care of itself and its surroundings. The EBAC ECO85 Dehumidifier is another addition to the EBAC range of “Eco Friendly”, Carbon reducing, range of dehumidifiers. The ECO85 has a maximum l/kWh (water extraction per kW of power consumed) of 2.47 l/kWh. This is achieved by utilizing a high capacity rotary compressor and an new environmentally friendly R407c refrigerant. The robust collapsible handle and semi-pneumatic tyres ensures transport and manoeuvrability are not compromised. It’s lightweight yet robust design is ideal for commercial and residential work. Its compact size permits one-man operation, yet it has the capacity to handle several room-size areas at a time. Best of all, it’s affordably priced within the budget of most restoration specialists. The Hours Run Meter provides an accurate means of measuring power consumed, allowing jobs to be easily and quickly evaluated when requested by insurance companies. 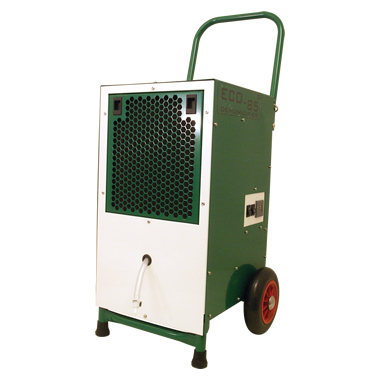 The ECO85 is equipped with a “Hot Gas” defrost system, ensuring a quick and efficient clearing of ice from the coil, allowing a minimum operating temperature of 3°C.